Today’s collection includes 25 clean and simple, unbranded minimalist themes that will suit any business and design portfolio needs. These templates could never cause yawning, together with beautiful illustrations and modern features they are sensational! Chalong is minimalist design, very clean and simple WordPress theme that will suit any business, corporate or design portfolio needs. It is built with the latest WordPress 3.0 features in mind. Admin panel is unbranded. Chalong comes with an ability to choose from unlimited number of colors using built-in color picker, 7 homepage slider styles, 30 header fonts, 3 different portfolio page styles, 10 custom widgets. It’s very easy to control the content which appears on your homepage. Choose what you want to show on homepage using the admin panel. You will quickly spot a lot more amazing features when you will start using Chalong. Built-in image uploader that supports multiple image upload, many shortcodes, charts and button styles, all that and even more will definately save you some time on building content. Structure is minimalist design modern theme with a magazine style layout. The idea of this clean theme is to adopt the style of the content you are going to add, making it ideal for variety of subjects. 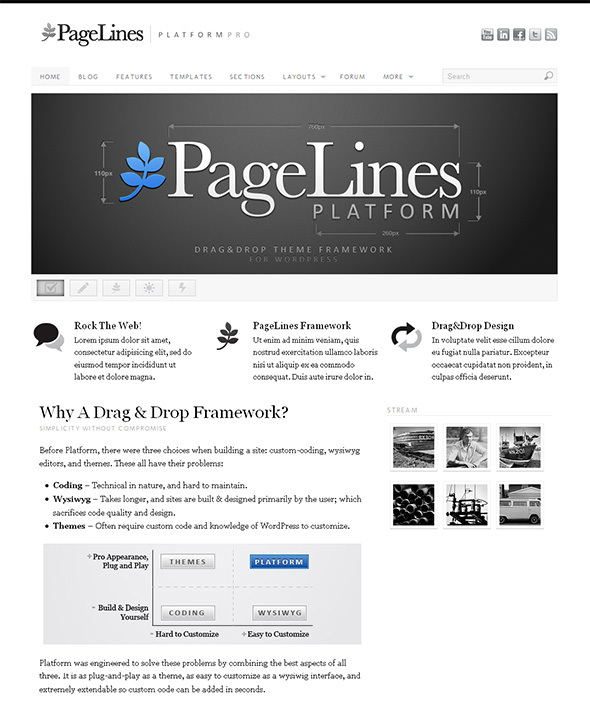 The Structure Theme has 2 color schemes – white and black version. The free version of Structure Theme doesn’t include free maintanance and support, doesn’t have theme options panel, video functionality or portfolio page templates. It’s a beautiful theme for the most basic use. 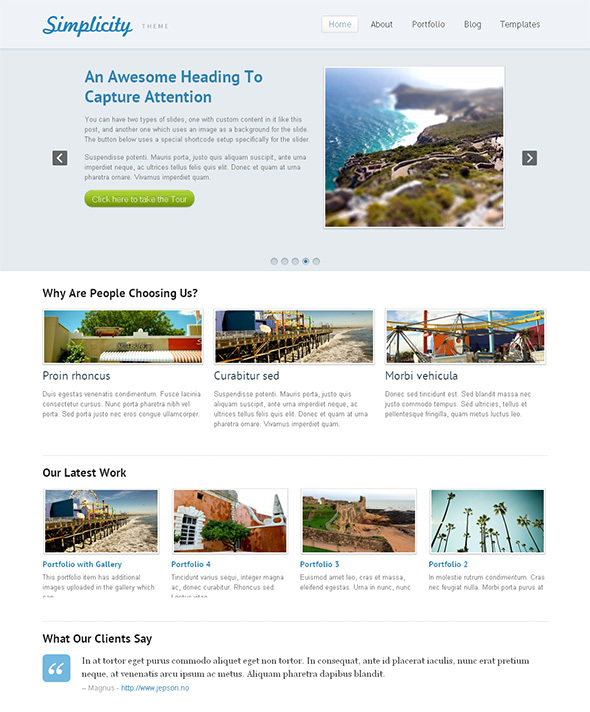 A custom home page featured slider to showcase your work or products with style, all powered by jQuery. Optional slider pagination gives your visitors easy overview. An optional integrated portfolio section driven by custom post types, which utilizies jQuery prettyPhoto script to display your work in a lightbox. Work-a-holic is one of those minimalistic and free WordPress themes that focuses mainly on showcasing portfolios for artists, web designers, photographers and illustrators. Minimalist grid-based designs put your content in front, allowing your site visitors to focus on your work, rather than distracting them with heavy-handed web design. Upload, crop and select your post thumbnails, all from the backend of WordPress. Spend more time producing content and less time managing it. Drag and drop widgets into a variety of positions, including the sidebar and footer of your site. 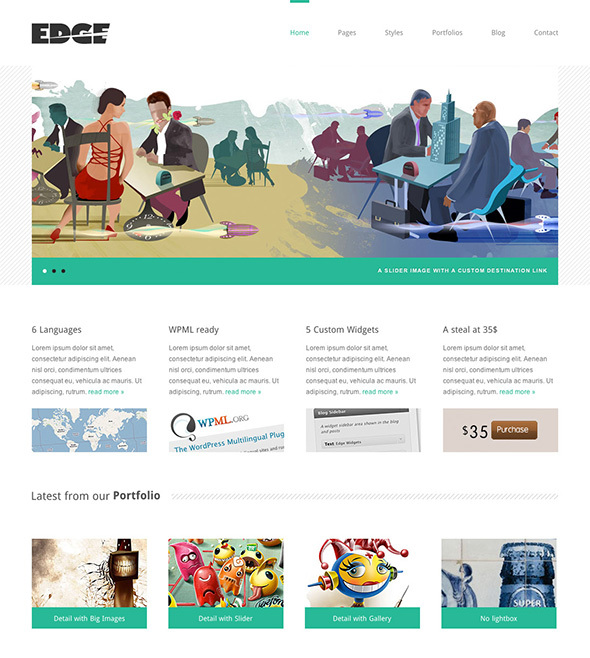 Edge is a Theme for WordPress that is well suited for professional online portfolios and corporate businesses. It includes XML file to import dummy data and images that will remind you about the possibilities you have. Extensive documentation with quality screenshots will guide you through the instalation and customization process. Edge comes with an easy to use admin panel, full of useful settings. Auto thumbnail generation will save you precious time that you could focus on writing good content and interesting descriptions. Theme has two different homepage sliders – a simple slider for raw images and a Stage slider with text descriptions and video support. Fully functional Ajax contact form is also included. Check out the product description for a full feature list. Platform Pro allows you to build a unique website in the way you want to. Choose from different design modes like “full-width” or “fixed-width” site design. 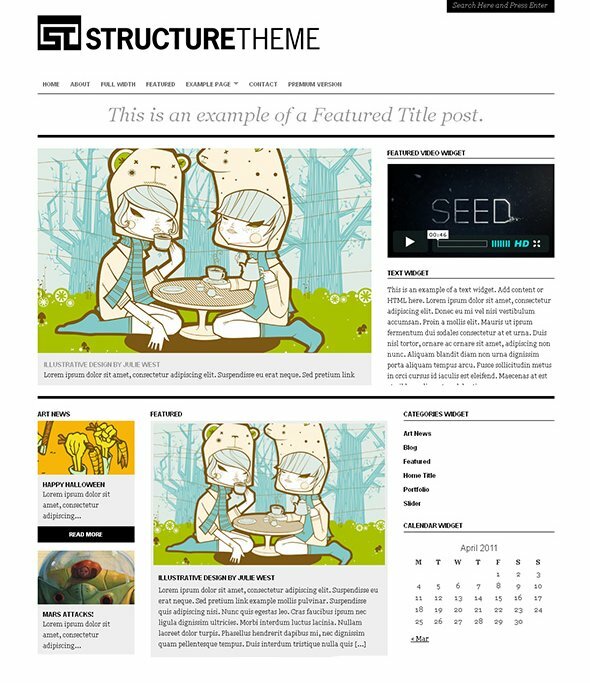 Use “magazine” or “blog” style layouts on your blog and posts pages. You can also drag and drop sections of content, create custom post types, choose layouts on a per-page basis. You’ll be surprised how flexible and easy it is. Platform supports the coolest new WP features like custom post types, menus, and custom ‘taxonomies’. Integrate the Google fonts API or Cufon based fonts in seconds. Tuned code for optimal search engine performance and accessibility. 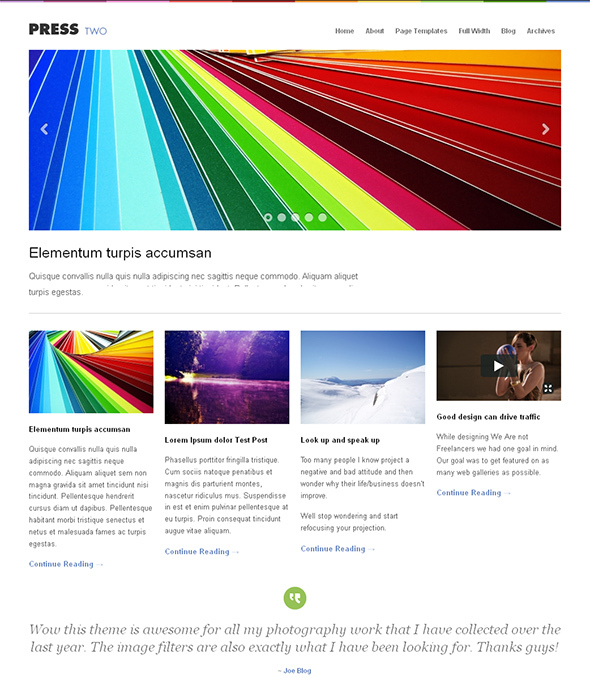 If you need a neat WordPress theme that is also free, why not try Aurelius? 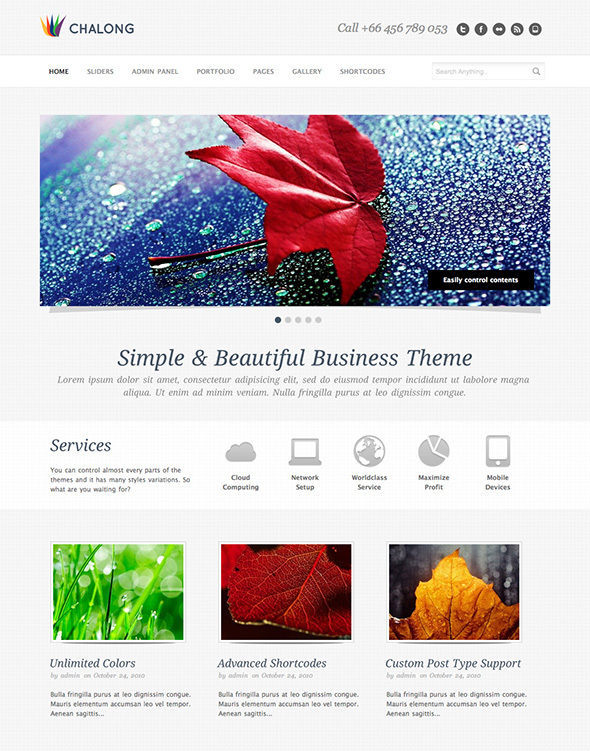 It’s a powerful CMS theme, suitable for personal (freelancer’s) and larger businesses. Aurelius has some nice features including jQuery roundabout for images, SEO friendly markup, powerful theme options and documentation. 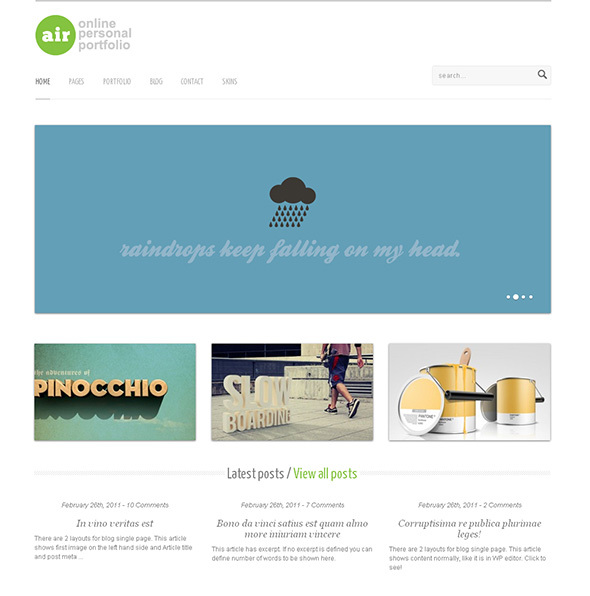 AirWP is great minimalist WordPress theme which has a very simple look. However, simple doesn’t mean old-fashioned, because the theme has many modern features such google web font integration, Nivo slider, portfolio grid view, jQuery dropdown menu, toggle effects, tabs and filtering. AirWP has many different page layouts: 3 styles of portfolio page, full width page layout, page with sidebar layout and a few more. Lots of shortcodes designed for everyday use of columns, buttons, tabs and accordion. 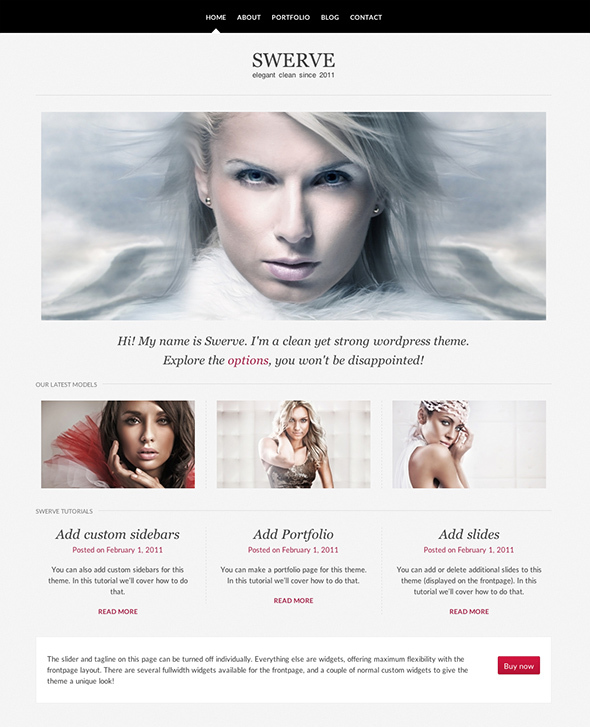 Swerve is a clean and minimalistic WordPress theme, packed with extensive options and focusing on the content. It has many buit-in widgets and shortcodes, unlimited sidebars and color settings. Make use of beautiful fonts, powered by Google, there are 32 of them. You can customize the frontpage by removing slider or tagline and everything below is a widget area for maximum freedom. Create your own sidebars and assign them to any page. Go and explore all the features, you won’t get dissapointed. * Disclosure: This post has some affiliate links. Clicking on the link and purchasing the item means that we will receive an affiliate commission. Elegant, simple, beautiful design that doesn’t sacrifice character or style. 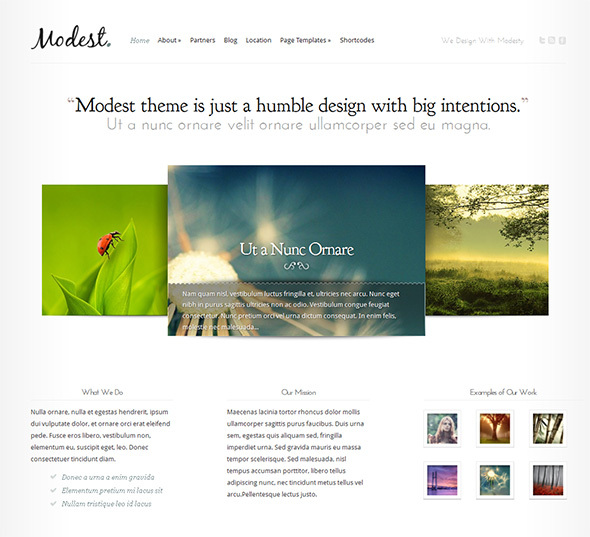 Modest theme strips down all the modern design details to give a lightweight and pure impression. 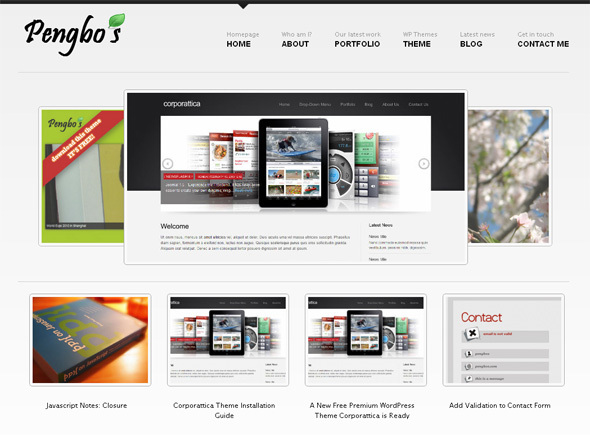 Cross-browser and WordPress 3.0 compatible, valid xHTML + CSS, ready to use theme. The homepage shows a welcome message to tell your visitors about you, along with social media icons. 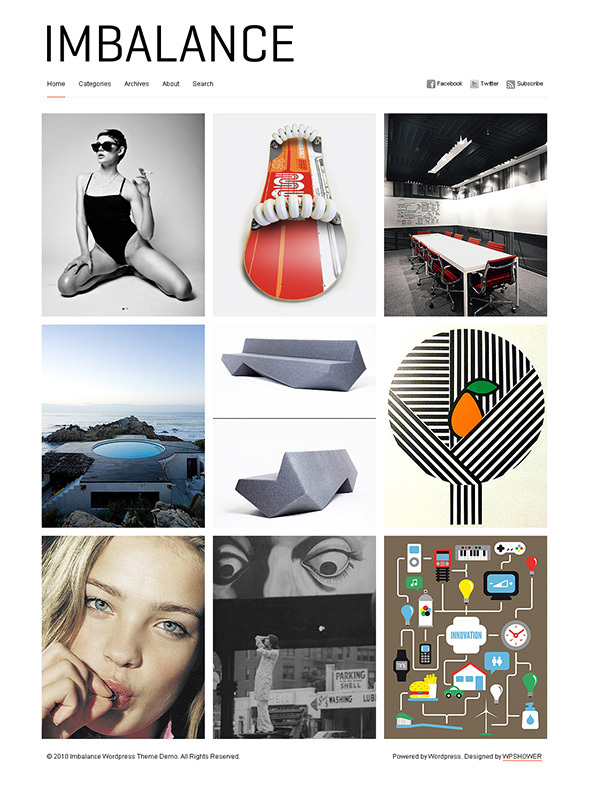 Last but not least is the slick portfolio section. The portfolio section shows your own custom post type portfolio items, and can also stream your Dribbble images if you have an account with Dribbble. Classica is gorgeous, clean and simple portfolio theme, free from gimmick and trend, making your talent the focal point of your portfolio – the way it should be. Classica is perfect for artists and anyone who needs a perfectly layered showcase. Classica comes with two portfolio page layouts: Stacked and Slider, it fully supports localization through .po/.mo file integration. Theme has 4 custom widgets, including Twitter and Video Embed. Unbranded theme options panel feels like it is a part of your WordPress platform. Magical WordPress 3.0 ready dropdown menus. 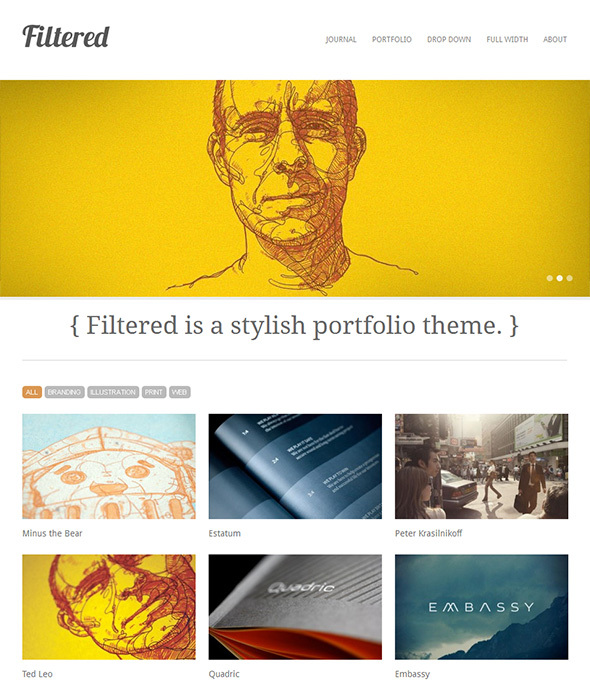 Awesome jQuery sliders and filterable portfolio, it is easy to fall in love with this theme. Powerful WordPress Theme that comes in 5 completely different versions that make it suitable for any kind of project and also extremely open to any kind of personalization. It was built taking advantage of the new WordPress 3.0 features including custom menus system, featured images and custom post types. One of the strongest points of this theme is the customization. It comes with two types of sliders and custom slide manager to manage each slide. Other great additions like Cufón Font Selector, Custom Widgets, many Shortcodes, a completely customizable Ajax Contact Form and much more. 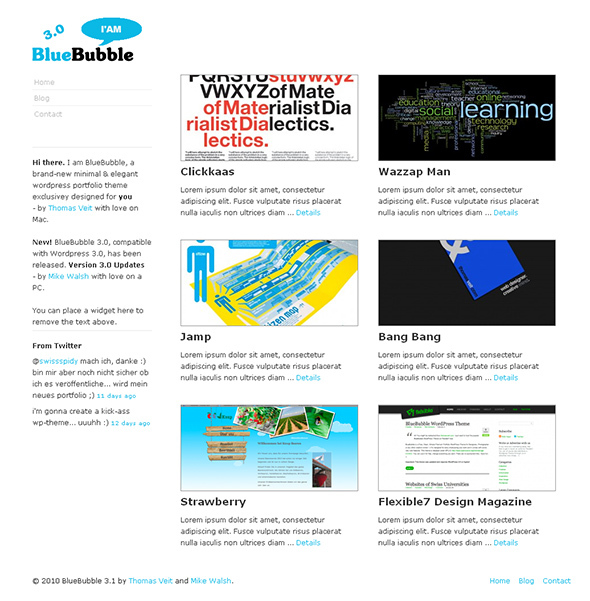 BlueBubble is simple portfolio theme for designers, photographers and other creative minds. You can use it for free under GPLv3 licence, there no sponsored links or similar stuff. 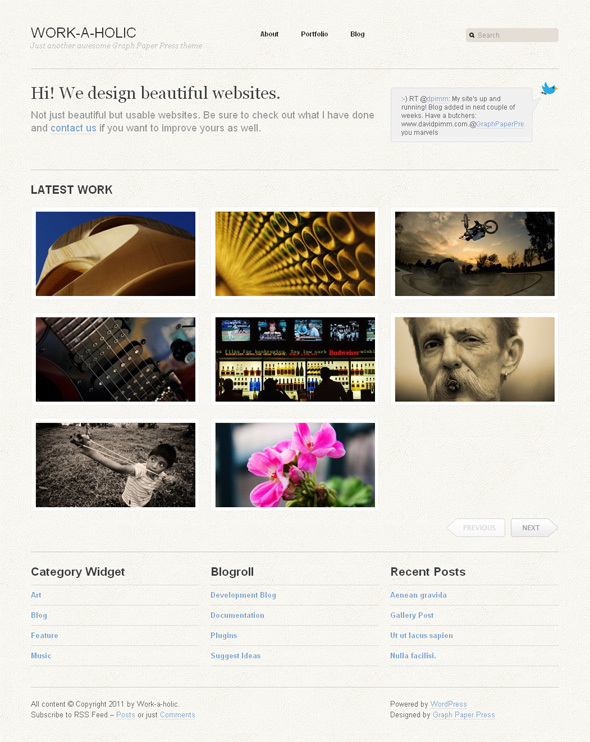 The theme requires WordPress 3.0 or higher and includes many great features. 8 different styles, social media integration, advanced theme options panel, CSS3 elements, ColorBox image popup for portfolio items, author details, working contact form, automatic image resizing, etc. 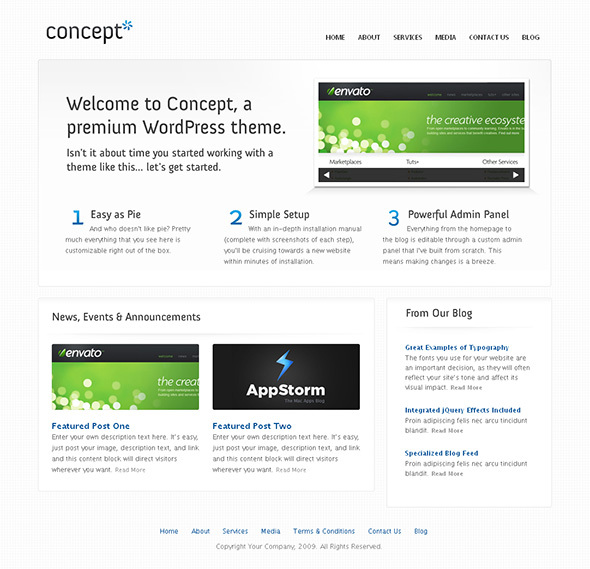 Concept is designed to be used for just about any site that need to have comprehensive yet simple layout. The frontend design has already been popular as HTML template just before the release of WordPress version, so the real highlight of this theme is a professional admin panel. 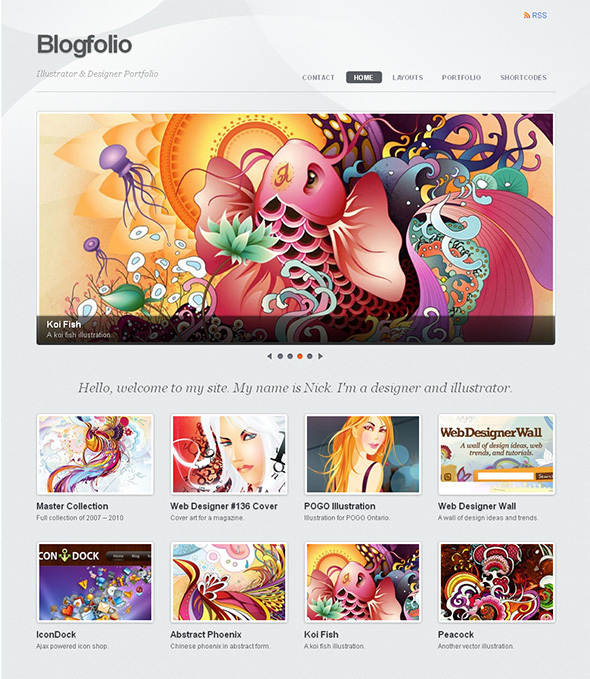 The package includes 6 uniquely styled themes, jQuery lightbox. jQuery gallery slider, SIFR font rendering, gracefully degrading code for older browsers, sliced PSD files. Admin panel gives you an ability to edit every major content block, adjust the layout quickly and easily without opening template files. A stylish portfolio theme that will give your work the type of presentation it deserves. On top of balanced white space and typography, this theme includes several tasteful jQuery effects to help impress your visitors. Luxury is simple from the outside and simple in the inside, designed to make your life and easier. Full WordPress 3.0 menu support with fallback to the standard menu system. Luxury is packed with custom portfolio, alternative homepage, author bios and loads of settings. Automatic post thumbnails allows you to change layouts any time. Latest posts, ad manager and footer thumbnails are all very usefull custom plugins included in this theme. Cufon font replacement adds a smooth and clean look to your headings. It’s marvelous WordPress Theme for Photographers with a simple, clean and tidy look to focus only on your work and talent. Present your fabulous photos or any other artworks in a unique Photo scroller on your homepage, it supports mousewheel scrolling! 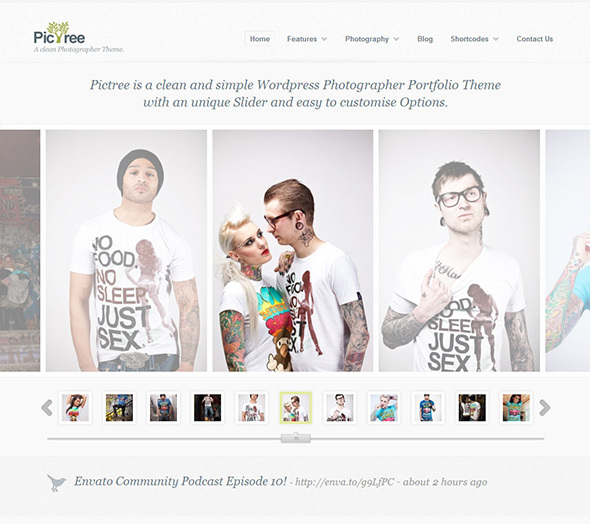 PicTree comes with black and white color schemes, many nice shortcodes, easy to follow instructions, well-organized theme options panel, custom post type for photos, lightbox for displaying large previews of your photos and videos. Control the homepage slider, change color scheme and logo, alter post and image settings, manage social media icons, do all this and a lot more in the extensive admin menu. Blogfolio is an advanced minimal theme with unique layout options to display your portfolio and blog posts. It is designed to give maximum space to display your work. 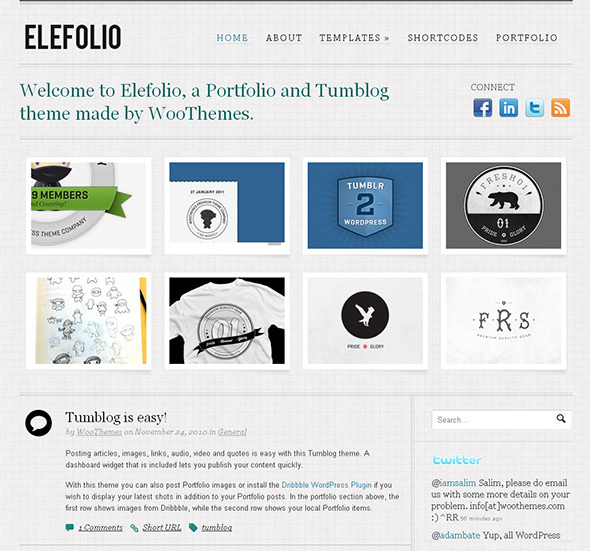 This theme is perfect for designers, illustrators, photographers and other artists. Threaded comments, custom menus and multiple widget areas. Lovely welcoming message and feature box on the homepage. Display either featured posts or custom images. Grid or list view layout options are available for home, blog and portfolio page. Auto-play slideshow gallery on portfolio page. 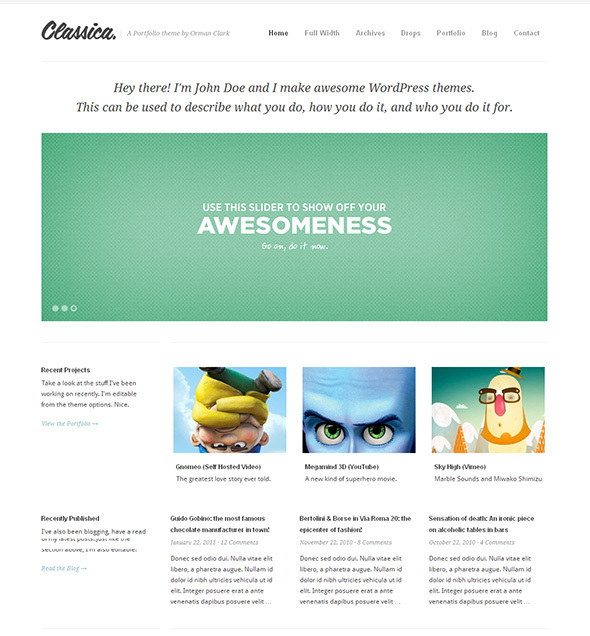 A super clean and minimal blog theme. Pure will give your blog an elegant and sophisticated feel without getting in the way of your content. Great typography and a good amount of white space make this theme stand out. 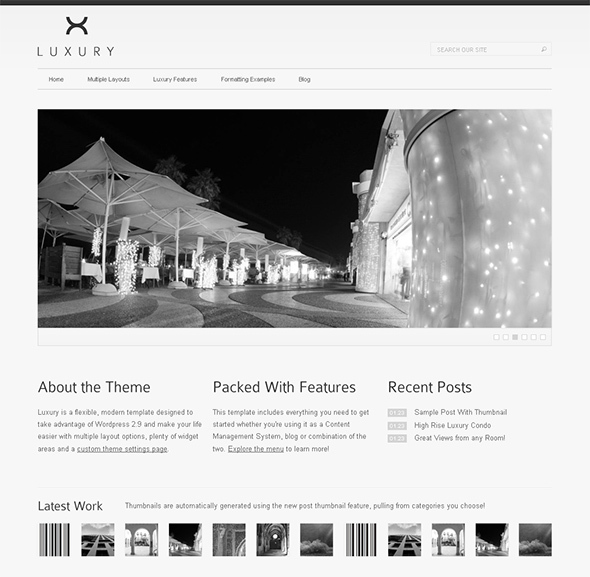 There are some modern features within this theme, such as jQuery featured content slider, image lightbox, custom options panel, custom menus and colors. Upload your own logo, integrate your tweets and flickr gallery. 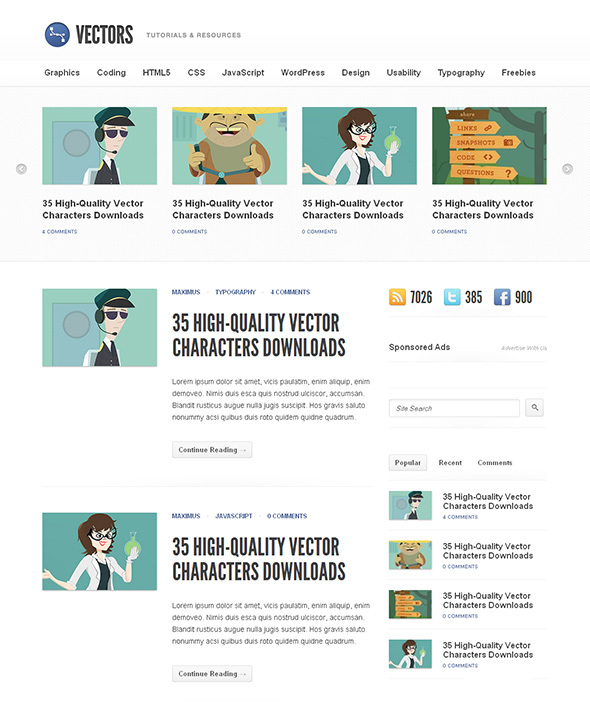 Vectors is a robust and well-organized WordPress community theme, designed for marvelous news presentation and blogging where photos and illustrations are the focal point of the content. If you are a creative blogger, artist or ordinary guy, it doesn’t matter what subject are you into, Vectors theme is ready to become your best friend. Whether you are looking to start a tutorial, best round-ups or industry news type of site, Vectors is here to meet your needs and expectations. Vectors is fully equipped with the latest WordPress 3.0 features, valid xHTML code, content formatting shortcodes, extensive documentation with screenshots, localization support, two widgetized areas, 10 color schemes, etc. It’s a unique, very elegant and minimal theme to present your business and work in the best way possible. There are 4 different color schemes, 4 dynamic sidebars, 8 different page templates, 2 stylish portfolio / news sliders, WordPress 3.0 custom menu support, many shortcodes, etc. It is very easy to add, remove and sort images for the sliders through the admin panel. 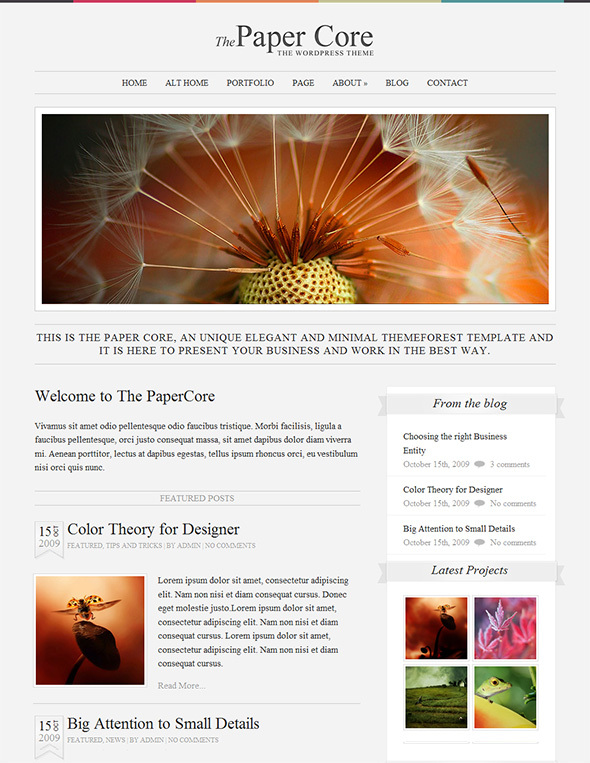 PaperCore contains a working AJAX contact form with validation, includes all the Photoshop files that are well organized and easy to customize. Elegance is a minimalist portfolio-style WordPress theme with beautiful typography and great layout. 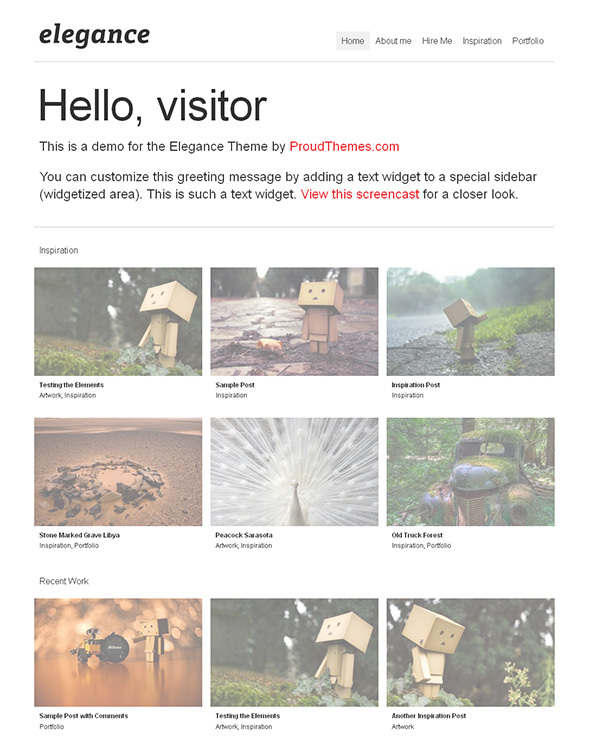 Setting up Elegance Theme is incredibly easy and takes just a few seconds. Elegance Theme uses a beautiful jQuery drop-down menu with a nice fade-in effect, powered by the new Custom Menu Management feature of WP 3.0. The homepage can be ‘constructed’ with the help of unique widgets. Elegance Theme has a custom widget to add links to your profiles on 22 social networks and sharing web-sites. Press Two is a minimalist blog theme which can be used for many different purposes. Template was built as a canvas for endless further modifications. It means that the boundaries are only determined by you. 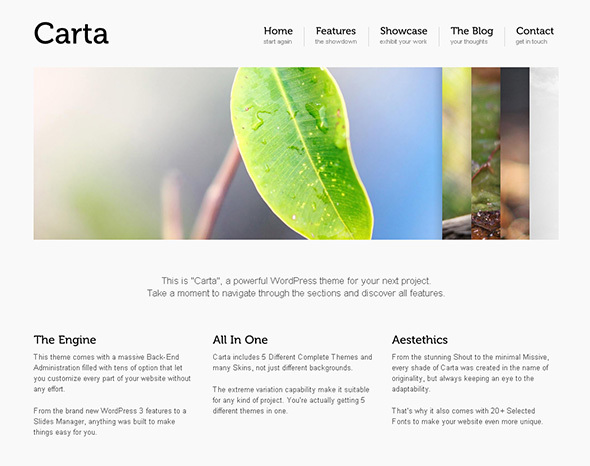 The latest WordPress 3.0 and many more modern features are integrated in this theme. 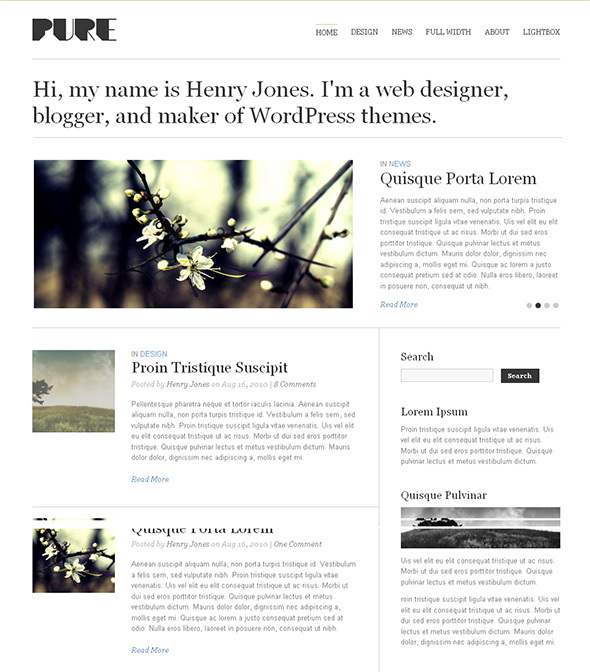 Custom post types, typography manager, 3 different layouts and jQuery slider have been included. Nice collection, I think I’ve used quite a few of these at some point or other. Great minds think alike! Classica is by fa the best one! I agree, Classica is my favorite as well! BTW really like the “subscribe” and “ads” widget on your site, so clean! Thanks Jamie, I’m a huge fan of minimalism myself, already have chalong, edge, studio box, classica and all of the freebies in my treasure chest 🙂 Amplify is also one of my favorites, actually every theme in this list is one of my favorites 😀 It’s really not easy to pick one, so good luck with your final decision… And, I’m glad you like my custom widgets, I’ve spent a few hours on those. Excellent work. Good minimalist designs really do express professionalism and quality. Another great minimalist theme for the list is Space. It does a good job of removing both unnecessary design elements and WordPress features, leaving users with clear and easy to read comment.